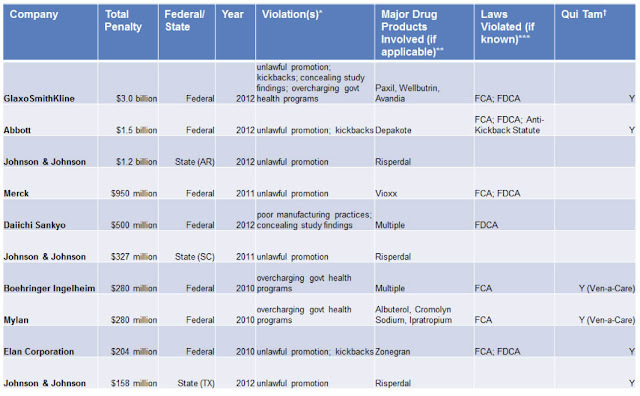 "A total of 74 additional settlements, totaling $10.2 billion in financial penalties, were reached between the federal and state governments and pharmaceutical manufacturers between November 2, 2010 and July 18, 2012, with the first half of 2012 alone already representing a record year for both federal ($5.0 billion) and state ($1.6 billion) financial recoveries. Since 1991, a total of 239 settlements, for $30.2 billion, have now been reached (through July 18, 2012) between federal and state governments and pharmaceutical companies." These data include Federal and State settlements. Between November 2, 2010 and July 18, 2012, state settlements were $2.5 billion vs. Federal settlements totaling $7.7 billion. "2012 already represents a record year for state financial recoveries," says Public Citizen, which notes that this 2012 state windfall was "largely due to a single court judgment in Arkansas in 2012 that required Johnson & Johnson to pay the state $1.2 billion for the unlawful promotion of the antipsychotic Risperdal. To our knowledge, as of the publication of this report, the company has not yet paid the fine and plans to appeal the judgment." Hopefully, JNJ will eventually pay up and help AK balance its budget and then some! 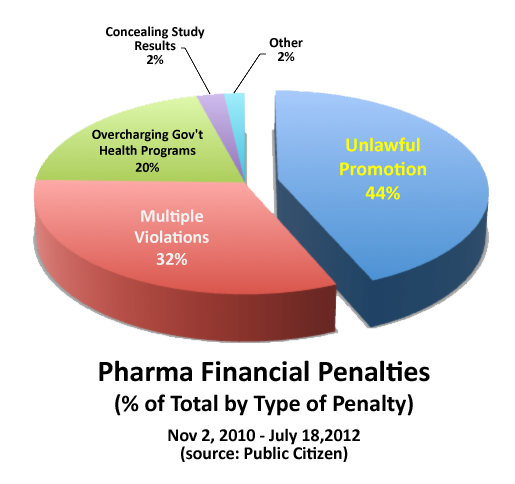 "Unlawful Promotion" -- off-label and other "deceptive" marketing practices -- represents largest slice of the pie. This is probably a low estimate because the category "multiple violations" must also include unlawful marketing violations. If only 25% of these were marketing related, then "Unlawful Promotion" would account for the MAJORITY of settlement fees. Congrats to GSK for being at the top of the list! 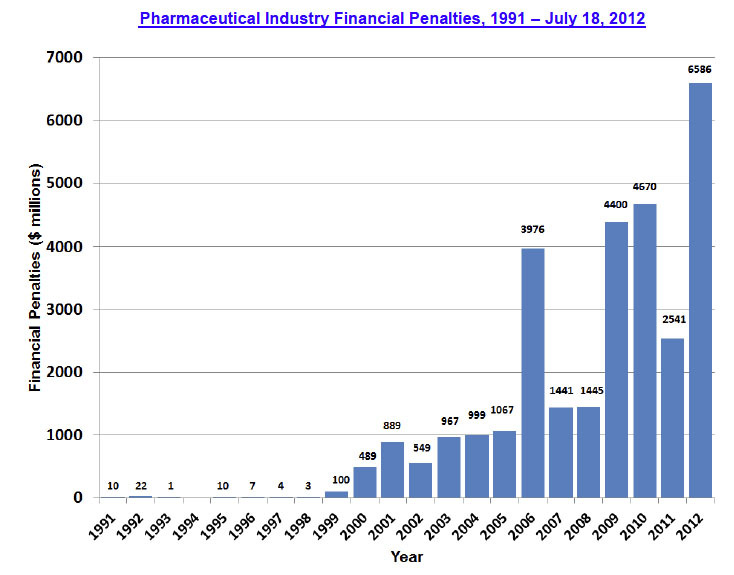 Whistle blower cases in 2011 didn't result in big financial settlements; consequently, 2011 was a "down" year overall.